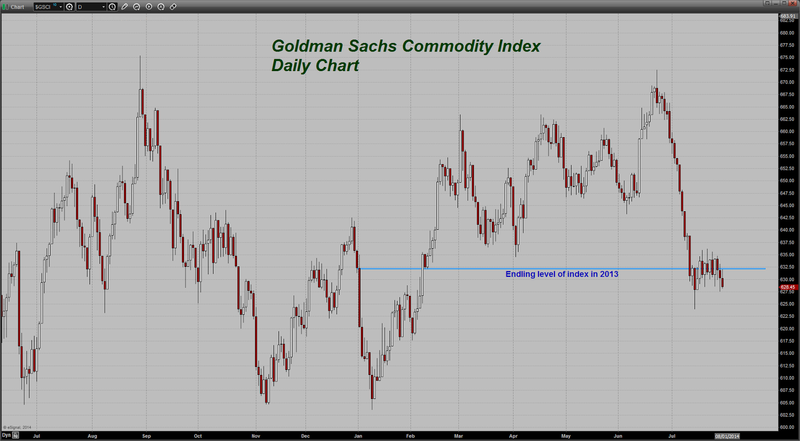 Euro gold fell to about €968, platinum lost $2.40 to $1472.60, and copper climbed a couple of cents to about $3.24. Gold and silver equities fell about 2% by late morning before they rallied back towards unchanged by midafternoon and then dropped back off again, but they then edged back higher in the last half hour of trade and ended with only about 1% losses. "A range of labor market indicators suggests that there remains significant underutilization of labor resources." Tomorrow brings Initial Jobless Claims, the Employment Cost Index, and Chicago PMI. Oil fell after the Energy Information Administration reported that crude inventories fell 3.7 million barrels, gasoline inventories rose 400,000 barrels, and distillates climbed 800,000 barrels. The U.S. dollar index found decent gains on better than expected GDP data that sent treasuries lower, but those moves pared a bit after today’s dovish fed statement. Today’s $29 billion 7-year note auction sold at a yield of 2.25% with a bid to cover of 2.58. Among the big names making news in the market today were Bank of America, Carlyle Group, IEX, Thomson Reuters, Hess, IBM, Sprint, Twitter, and Toyota. “Today's stronger than expected Q2 GDP number (4% compared to expectations of 3%) has ramped up selling in the longer dated section of the curve. 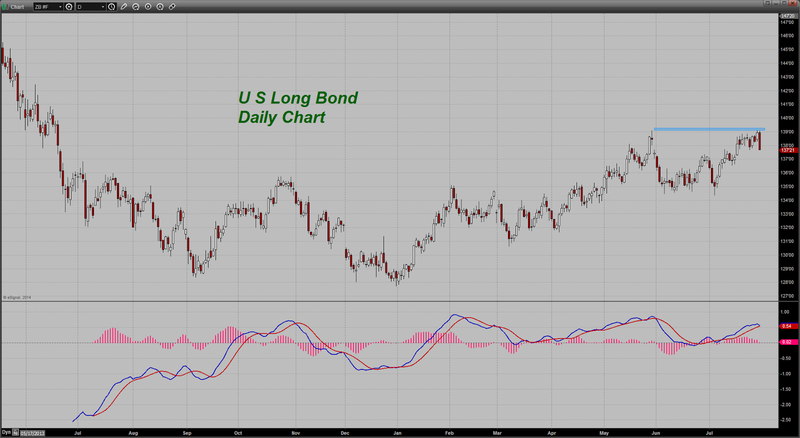 The long bond is down over a full point as I type these comments. The Dollar is also benefitting, particularly against the Yen today, as forex traders are buying it and selling the rest of the majors. Talk has now shifted (at least for today) firmly in favor of higher interest rates coming to the US before any of the other industrialized nations. 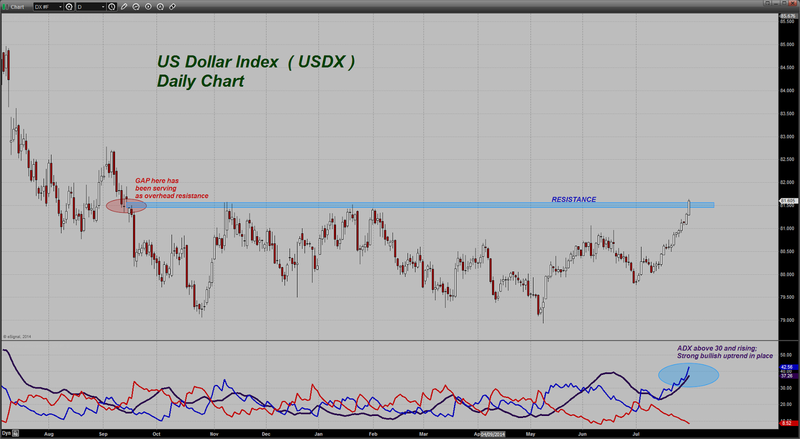 Take a look at the daily chart of the US Dollar (USDX). Note that the greenback has run right into the zone of heavy chart resistance pictured on the chart. That resistance zone is a function of a downside gap made all the way back in September of last year. The gap has served to cap the Dollar's upward movement for nearly a year. Seeing it challenged today is therefore something that should not be ignored. If the Dollar can punch through this level on a closing basis today, and then repeat it tomorrow, we should see some additional buying come in. Bean prices are giving up the gains from their recent rally that was due to heat and dryness talk. Bulls talk that up every season so that is not new. The forecasts however are showing some rain entering the mid-West next week and with no searing hot temperatures anywhere in there, growing conditions remain very good for the majority of the crop. Yes, there are some areas where the crop deteriorated slightly (I noted that on my Monday take on the USDA Crop Conditions ratings) but those small pockets cannot detract from the fact that the majority of the crop is still in very good shape. COMEX Gold Trust (IAU) Total Tonnes in Trust: 165.66: No change from yesterday’s data. Silver Trust (SLV) Total Tonnes in Trust: 10,014.63: No change from yesterday’s data. Randgold’s (GOLD) meeting in Mali, Barrick’s (ABX) dividend, Primero’s (PPP) project update, Turquoise Hill’s (TRQ) sale of its 29.95% stake in SouthGobi Resources, and Excellon’s (EXN.TO) second quarter results were among the big stories in the gold and silver mining industry making headlines today.